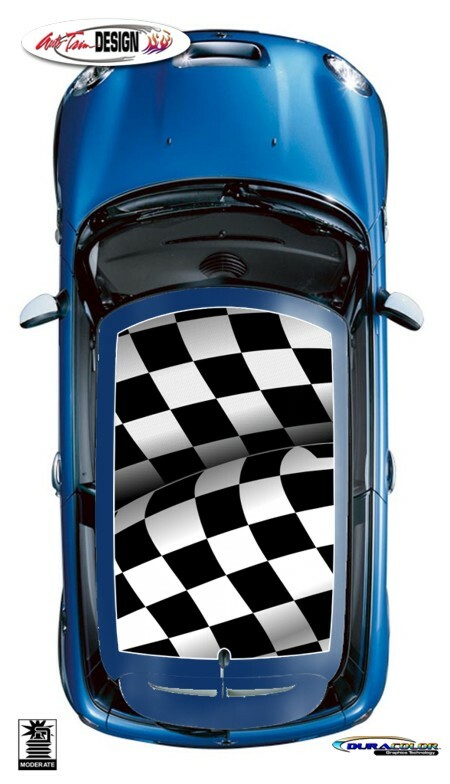 This Waving Checker Flag roof graphic kit will look great on your '59-Current Mini. Roof graphic is precut to fit perfectly on your Mini's roof area as shown - no trimming required! Designed for any color of Mini roof, flag pattern is printed onto white premium cast automotive grade adhesive-backed vinyl with our DuraCOLOR process. Moreover, the graphics are covered with a 2 mil clear gloss laminate which will protect the graphics from miles of abuse. Graphic component is covered under an Oracal OCS7 Seven (7) Year Limited Outdoor Warranty. Easy-to-follow general online application and care instructions are included. This graphic kit will not fit the Mini Clubman and is not intended for use on Mini's with a factory sunroof.